Infatuation is a rather irrational feeling which has surely gripped you at some point of time or the other. Dealing with such a burning desire within you is not always easy and it sometimes causes one to act in a foolish manner. It doesn’t take much for one individual to be infatuated with another, given the fact that it is a rather superficial feeling that is likely to fade away soon if the other person fails to reciprocate. This is the true meaning of infatuation and one should also keep in mind that there is a difference between love and infatuation. If you have a slight feeling that your boss is in love or infatuation with you, then given here are some sure signs that proves it right. The following mentioned are few causes and reasons as to why an individual is infatuated with someone. Being in close proximity with a person, day in and day out often gives birth to infatuation. Bosses are people who do not get to have much of a social life given the fact that they devote all their effort into ensuring that their company functions well. 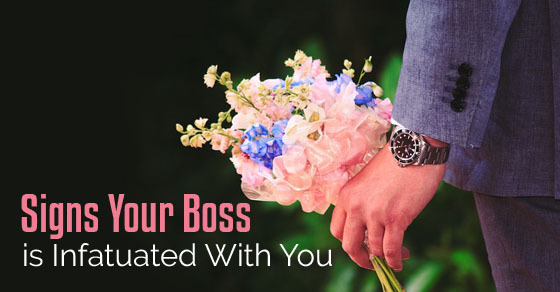 You boss might be infatuated with you if he spends a large number of hours in a day with you and finds that you are devoted to the company just as much as he is and that you are very passionate about what you do. Even small things like this, gives rise to the feeling of infatuation. Infatuation is often closely linked with body language. A person who moves along effortlessly and conducts himself well is sure to incite feelings of infatuation in another individual. Chances are that your boss is infatuated with you, if you have very good mannerism and this is something which he finds very endearing. Nowadays not many people pay attention to their manners and decorum and if you are one of the few people who does, then you are sure to have a number of people who are infatuated with you. This is, most often one of the main causes of infatuation. Good looks are something which meets the eye the soonest. It is one of the main things which causes infatuation. Your boss is bound to be infatuated with you, if you are someone who has very good looks and if in addition to that you are also smart and quick witted. This having been stated you must ensure that you do not make use of your good looks to get things done for you as this is something which is rather unethical. If you are good looking and have a good body then this is likely to a sexual attraction between you and your boss. In this modern era, everyone is busy chasing after their own dreams and hardly any of us have any spare time on our hands. The sense of loneliness and depression is something which grips the modern man so much so that he goes into a little shell of his own. What causes this feeling of infatuation for many is their loneliness. Their sense of loneliness causes them to constantly look for attention and approval from others. So if you happen to give your attention and show your concern for a lonely individual, chances are that he might become infatuated with you. The following mentioned are few tips to identify infatuation or love symptoms and tips on what to do if your boss likes you. If a person is infatuated with you, he or she constantly looks for occasions to be alone with you. This is one of the major signs of infatuation. In addition to seeking out some alone time with you, he also gets incredibly jealous if by chance you even talk to someone else. This is one sign of infatuation which is rather easy to read. In addition to this, the person might even go so far as to ask you out on a date of sort to a restaurant or café. If you are genuinely not interested then you should turn in down in a polite manner. You can tell a person is in infatuation or love with you, if your very presence causes him to blush a little. This blushing or smiling is something which the person does not voluntarily do and it just happens. This are some infatuation signs which is rather easy to detect. On the inside, the person who is infatuated with you will receive butterflies in his stomach. In the attempt of trying to come across as smart, so as to impress you, the person might end up saying something foolish or silly. A person who is infatuated with you will feel shy to even make eye contact with you or even address you directly. In addition to this, he will look for little opportunities to make even slight physical contact with you. In addition to this, you will find that the person might not even have the confidence to come up and speak in front of you. In this day and age all of us make use of social media in one form or another, whether it is Facebook, Twitter or even Instagram. Given the fact that there have been so many technological advancements in the recent past, we are even able to access these sites though our mobile phones. A sure sign that a person is infatuated with you is if he or she likes and even comments on all your pictures or status updates, almost as soon as you upload them. In addition to this he might even constantly start chatting with you, whenever he notices that you are online. Chances are the person is infatuated with you a great deal if you find that he constantly pokes fun at you and tries to involve you in every joke which he cracks. You might think that given the persons behavior, he probably hates you, but it is not so. He is probably trying to conceal his feelings for you by poking fun at you in front of other people. Do not let what he says affect you in any way as this is nothing but a mere defense mechanism, often employed when someone is gripped by feelings of infatuation. Signs and symptoms of infatuation are such that they eventually fade away over a period of time and most often they are absolutely baseless. As opposed to this, signs or symptoms of true love do not fade away over time because they are very true and never fade away no matter how much time goes by. Infatuation is something which will not cause the person who is infatuated with you to go out of his way to do something for you. Where as a person who is in love with you, will be selfless when it comes to doing something for you. Signs of infatuation are such that they develop rather suddenly. As mentioned above, a person’s good looks or mannerisms might cause him or her to be infatuated with you. This infatuation can be developed in the matter of a day or even a few hours. As opposed to this, you can only fall in love with someone after you have spent a considerable amount of time with them and have come to connect with them on an emotional and psychological level as well. Signs of infatuation are such that most often, they are merely related to physical attributes such as a person’s looks, his smile or mannerisms. These things do not mean much and as mentioned above they are unable to with stand the test of time. As opposed to infatuation, the signs of love are much more deep seated and are based on concrete feelings which have developed progressively over time. If you find that you are infatuated with your boss, you should do your best to ensure that you curb your feelings as being infatuated with your boss is a very bad idea indeed. Very often, your boss is not going to reciprocate in the same manner as you and that is just going to hurt you even more. It is okay to admire your boss and be in awe of how much he has been able to achieve over the years, but that does imply that you let these things get to you and start being infatuated with him hoping for things to go on to the next level soon. Being infatuated with your boss will show you to be someone who is terribly unprofessional. When working in a top corporate company, you must ensure that you do not let your minds play tricks on you and lead you on to believe that your boss has the same feelings for you. Maintaining a professional distance with your boss is very important and you should not harbor any kind of feelings or emotions towards him. If you do, then thoughts of him will not only constantly play on your mind, but it will also affect your work a great deal. Your boss is someone who has made it to the top after a lot of hard work and it is unlikely that he is going to let his reputation be tarnished in any way at all. If he finds that one of his employees harbors feelings for him, he is most probably not going to take this lying down and chances are that he might even fire you for even thinking about something like this. At no point in time should you mistake his kindness for you as some other feeling towards you. The following mentioned are few signs your boss is attracted to you or infatuated to you or in clear words if your boss likes you. A sure sign your boss is infatuated with you is that he will never lose his temper with you and he will try his best to give you advice so as to make things easier for you. Given the fact that he is a skilled professional he will not let this get in the way of his work, but he will just be a little lighter on you and not show his disdain if you happen to make some mistake when giving up some work. You can tell your boss is infatuated with you if he looks for excuses to come up and talk to you. Even if there is nothing work related to be said to you he will just come up to ask you how things are and how your day is going. In addition to this you can also tell he is infatuated with you if he listens carefully to all that you have to say and tries keeping in mind your point of view when making decisions. Finally a sure sign your boss is infatuated with you, is if he constantly compliments you whether it is on what you are wearing or even some project which you work on. If you are able to read the signs correctly and are sure that your boss is infatuated with you, then you should make it a point not to react to it or that is going to seem really bad on your part and might even tarnish your professional image a great deal. News like this travels fast in the business world and it is for this very reason that you have to always be mindful about how you behave, just so that you do not end up needlessly leading anyone on.